Remember when cramming a baseball card into your bicycle spokes was all the rage? That's still ace, but here's something a little more...high-tech: The folks at MonkeyLetric have shown us spinning LED displays before, but never one as impressive as the Monkey Light Pro. 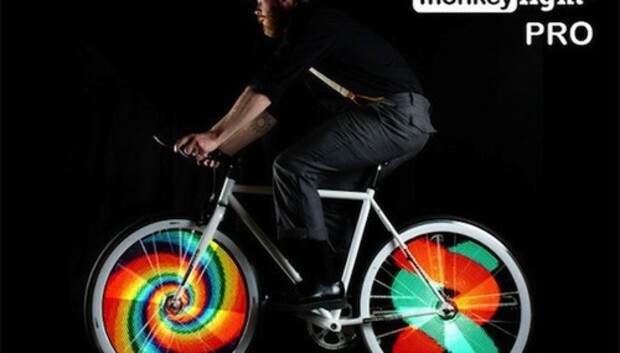 This gadget, currently in Kickstarter mode, effectively turns your bike wheels onto customizable animated luminous discs. Motorcycle noise sold separately. Here's how Monkey Light works: As you ride, sensors measure how quickly your wheels rotate, and tell the device how and when to display carefully timed flashes of light. The phenomenon of persistence of vision, or the split-second that an image seems to endure after it's flitted away, allows spinning strips of lights blinked in rapid succession to effectively craft a circular LED display. What MonkeyLight displays is entirely up to you. The Monkey Light Pro will feature Bluetooth connectivity, through which you can select from a gallery of custom options supplied by MonkeyLetric. Make it look like you have an animated dog or have it tell startled drivers to stop, or profess your love of Internet cats----the choice is yours! For the more ambitious lot, MonkeyLetric will provide an API for custom development. The integrated rechargeable battery boasts up to an eight hour lifespan for your 70-pixel-diameter display. Images orient correctly to each side, which is important for text, if that's what you'd like to display. It's waterproof, it's theft-resistant courtesy of steel straps, and it will add a little over a pound, evenly balanced, to your bike. MonkeyLetric's Kickstarter project is open until June 21, and it's already amassed nearly half of its $180,000 goal. The cheaper half of the early bird specials have been snatched up already, but if you hurry you can grab one of the few remaining $695 kits. The $795 selection is populated by a solid thousand, so only the latest of late will be springing for the $895 retail price.